Being very lucky in the fact that fresh fish is readily available, I am able to shop for supper the day I want to eat fish. We have a fish monger a block from the office and I head in there to see what they have available and then plan my meal around the fish. 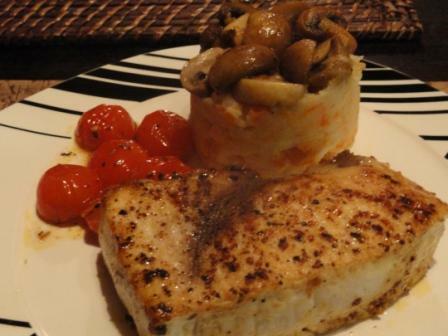 This lovely piece of swordfish made a wonderful supper, served with potato and carrot mash and pan fried tomatoes and mushrooms. The trick to cooking fish is to season before you cook, and make sure it is not overcooked or undercooked. You need to watch the pan closely. I use a knife to test the fish – just stick it in to the meatiest part and withdraw straight away. Touch the knife to your lips – if it is hot, the fish is cooked. You can’t beat fresh fish! Your swordfish dinner sounds superb.